1- NÁSTIC: Rubén Pérez; Ruz, Cáceres, Llera, Mingo; Abel, Juan (Merino, 53’); Cuellar, Pinilla, Gil (Campano, 68’); Makukula (Ismael, 71’). 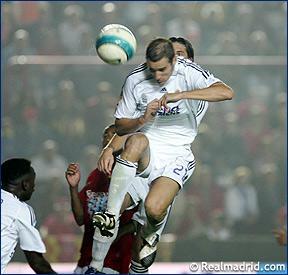 3- REAL MADRID: Casillas; Ramos, Helguera, Cannavaro, Roberto Carlos; Raúl, Diarra, Emerson, Guti (Reyes, 72’), Robinho; Van Nistelrooy. 1-0, min.29: Abel penalty kick. 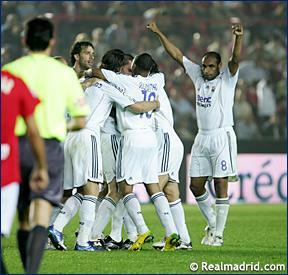 1-1, min.43: Roberto Carlos direct free kick. 1-2, min.49: Helguera header off Guti corner kick. 1-3, min.84: Robinho cross shot. NOTES: Matchday 8 of the Spanish League played at the Nou Estadi in Tarragona filled to capacity. 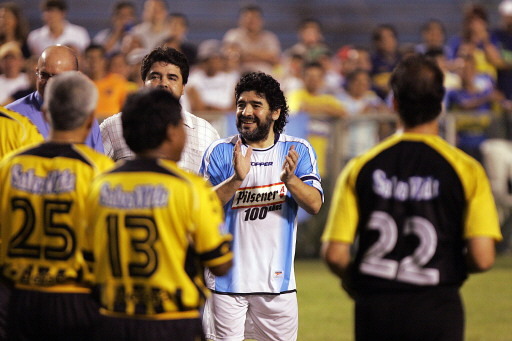 †Diego Armando Maradona (C), applauds at the Olympic stadium in San Pedro Sula, 25 October 2006. Maradona of Argentina tours around Central America.